David Ortiz is the only current Red Sock with rings from 2004 and 2007, so it’s no surprise that he wants another. If the Red Sox made it all the way, Papi would be the only person with all three. "Oh man, you feel like Michael Jordan. 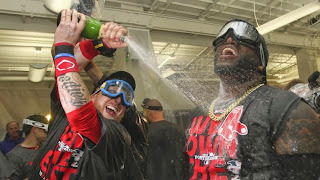 He did it," Ortiz said according to MLB.com’s Ian Browne, referring to the six championships Jordan won with the Chicago Bulls. "Why couldn't we? That's another level anyway." Being in the visitor’s clubhouse at Coors Field in Denver on Wednesday brought back fond memories for the slugger, memories of his second World Series ring. He told Browne how the thought of a third ring has been keeping him in good spirits as of late. "That'd be great, man. I got to start looking for my other two, I don't know where they're at," Ortiz said. "I never wear them, though." Ortiz has seen a lot of postseason in his career. He went with the Minnesota Twins in 2002 and with the Red Sox in ‘03, ‘04, ‘05, ‘07, and ‘09. And of course, that’s always the goal for Big Papi. That’s why the two seasons before this one were particularly bad for him. "That stunk," Ortiz said. "Then, the funny thing about it is, the playoffs are kind of longer than ever when you're not in it. It was long, but now going to the playoffs, it's great. I get prepared to play baseball all the way through to the last day, and here we are." Ortiz has been instrumental in every Red Sox postseason. He’s a huge part of the reason that they have two World Series championships over the last 10 years. And this season is no different. Even with an achilles injury that kept him benched the first two weeks of the season, Papi has is hitting .307 with 29 home runs, 100 RBIs and a .956 OPS. Anyone who has ever seen David Ortiz pick up a bat can see that he’s always swinging for the fences. Though Ortiz did mention that manager John Farrell checks up on him often. "Once I started playing, you're not going to get me out of there," Ortiz said. "John's been really good at asking me, but once I'm in, I'm in. I don't care about anything but playing and trying to win ballgames. I was supposed to play I would say, 20 to 30 games less than what I have. That ain't me, dog. I don't buy into that." Farrell appreciates Ortiz’s attitude as well. "I think we realized as long as he got healthy, he was going to produce," Farrell said. "Clearly he's done that. The thing that stands out to me about David is he seemingly has played with a renewed energy. There's a positivity about him -- [from] the way he's run the bases to the encouragement he's always given his teammates. I just look at a guy who is coming off a severe injury and he's appreciative of the game when it's been taken away for a little while. He's played with that renewed energy that has been awesome to see play out." After last season in particular, 2013 has been a welcome change for all of the Red Sox, but perhaps it hasn’t affected anyone quite like Ortiz. He first came to the team as they were becoming one of the decade’s baseball monsters. It can’t be easy being on one of the worst teams in Red Sox history after that. So if the Red Sox can pull it off, there’s nothing more that I want to see than the smile on David Ortiz’s face when the final out is made.